Al fresco dining, while you’re camping, is one of life’s little joys, isn’t it? And it’s an even more pleasurable (not to mention comfortable) experience when you’ve brought your own table! These days the quality of portable, foldable tables has vastly improved, so they’ve become a genuinely viable option even if you previously thought their size and weight might be a problem. Take a look at these great options when it comes to picking the best camping table for you – and you might be surprised at what’s available. I’ve also included my usual buying guide and FAQ to help you make the right choice. What is the Weight Limit of a Camping Table? Can I Put a Camping Stove on These Tables? How do Camping Tables Fold Down? Review: Starting us off is this simple but effective foldaway camping table. Its compact size is super portable, and its lightweight, durable resin build is sturdy and solid. It’s coated with a UV-inhibitor so its bright color won’t fade over time in the sun. The table splits in the middle to fold down and has got so many applications you could use it anywhere. Only suitable for one – perhaps a little on the small side. A multi-use, solid little option that will work anywhere and is attractively bright. Probably best used as a side table. Review: A nylon cloth covered table that packs away into its own carrying bag with a shoulder strap. Two mesh drinks holders are incorporated, and tension lines built into the frame to keep it steady when erected. Pops open in a heartbeat and weighs just 2.4 lbs. A little on the small side. Won’t take a lot of weight. A lightweight camping table that’s a great backup option for spontaneous fishing trips or last-minute camping getaways. Review: A tough polyester and metal frame construction, this folding table offers four mesh drinks holders and packs neatly into its own, efficient carry bag. It sets up and folds down swiftly and has an extra tier below the main table for storing other bits and bobs. Again, won’t take as much weight as stronger tables. A slightly larger version of the previous fabric offering, the lower tier is a nice touch and the carry bag is really useful. Review: This is a really attractive table with a top made from aluminum. It’s waterproof and durable, and much easier to clean than fabric or wooden tables. Offered in small, medium and large sizes (price depending on each), it dismantles easily for transport in a super portable, shoulder-strapped carry bag. The blue option is particularly striking. Only comes up to your knees – might not be ideal for some. 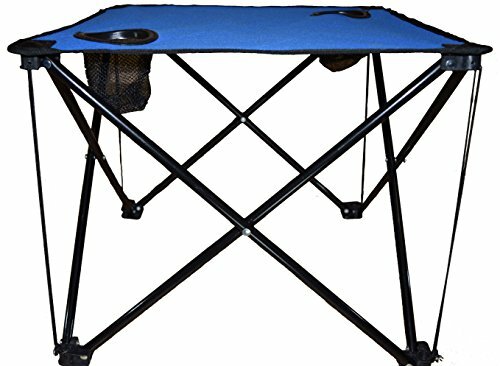 An attractive yet sturdy choice that could well be one of the best portable camping tables available. 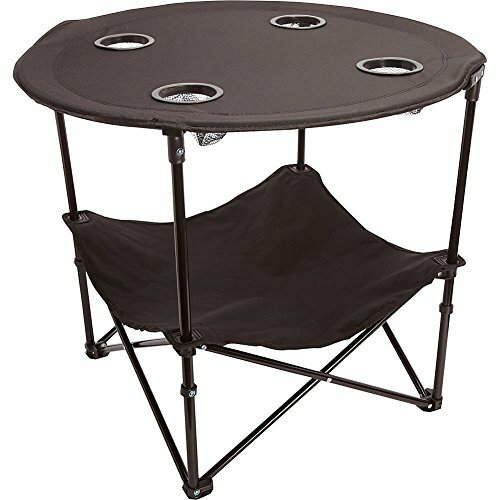 Review: Another variation on the fabric table with mesh cup holders, this is a rectangular design that many might prefer over the circular options. It has that all-important 600D ripstop nylon and an aluminum frame, making it lightweight and durable. This particular model comes in a choice of sizes – two or four cup holders. No carry strap – it’s a drawstring bag. A smart, functional design that has a super quick set-up. A great option for picnics. Review: This ALPS Mountaineering offering folds in on itself super fast to be transported and stored anywhere. It’s clearly marketed to double as a gaming table with the checkerboard design – and is great for playing cards on your vacation. Its 600D polyester construction also offers a lower tier, cup holders and useful zip pockets. As with most cloth tables – there will always be a dip in the middle. If you’re into gaming while on holiday – look no further than this table. A real sociable option for your group or family. Review: The first of our suitcase folding tables which are, in my humble opinion, much better for comfortable dining than fabric tables. This all-purpose table is made from powder-coated steel and tough, durable plastic. It’ll seat four with ease and can be height adjusted. Has a weight limit of 800 lbs. Much heavier than fabric tables. A great option if you need to sacrifice portability for strength. 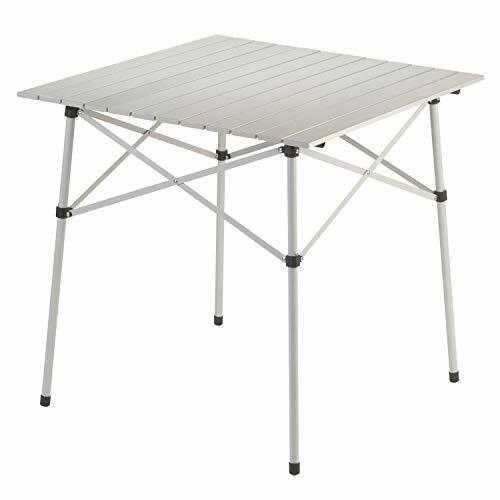 For the price, it’s one of the best folding camping tables available and will easily hold all your camping cookware. Review: Moon Lence manufacture practical, portable camping gear and this useful design is no exception. 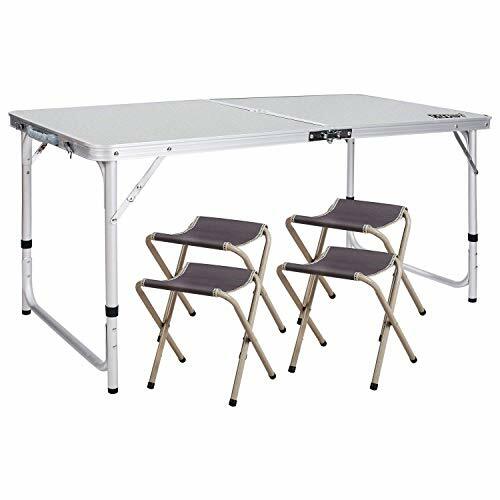 A solid, aluminum table top includes a mesh lower tier for storing lighter items, while the table joints are bungee-cord linked like tent poles for ease of assembly. Very low to the ground with no option to adjust. A good choice if you’re happy kneeling or sitting on the floor, you can purchase connectors to mix and match tables together. Would fit nicely under camping tarp if the weather turns bad. Review: As one of the best camping tent brands out there, it was only a matter of time before Coleman weighed in. A strong steel frame and the aluminum top is clearly well constructed in a snap-together design. A little cramped for more than two. 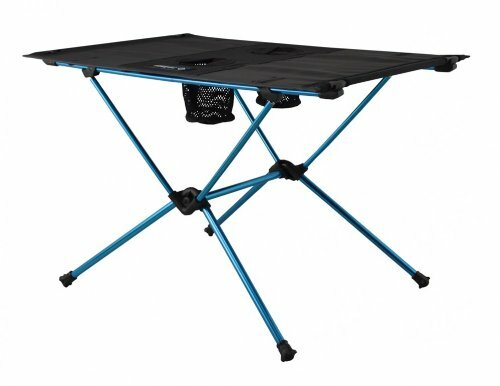 Another quality bit of kit from Coleman, this compact design is one of the best camping tables for two there is. Review: A little curve ball thrown in just to mix things up, I really like this portable picnic set. 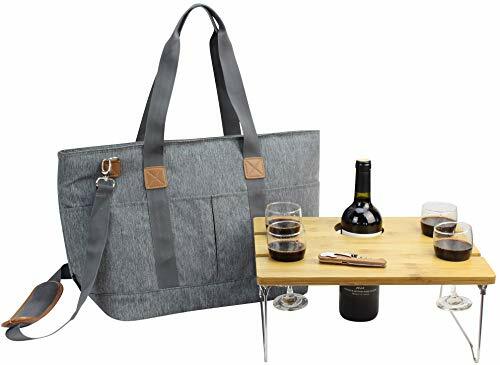 It’s great for taking a bottle of wine and some friends to the park, ensuring that nothing is going to get knocked over or spilled. Which would be horrifying if it’s a good, Chilean red. If you like al fresco dining – this just might be for you. Not so great on the dining, though. Review: Another suitcase style folding table, this one has the advantage of offering 600D Oxford cloth compartments that attach below the table – itself made from solid MDF. It’s excellent to be used as part of a portable kitchen, keeping food protected with your camping stove nearby. Great for dining, working or food prep. An all-purpose table that really comes into its own with the very useful storage compartments underneath. Ideal when you’re entertaining. 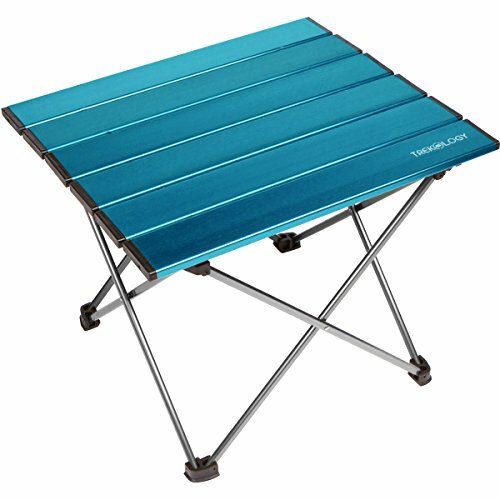 Review: The main advantage of this foldable camping table is that it comes with four stools inside. You can set everything up or pack everything away in seconds. Made from a combination of MDF and aluminum, it’s durable, waterproof and stain resistant. There’s a load of other features included too, such as anti-slip feet, secure latch and parasol hole. Stools might be too small for some. 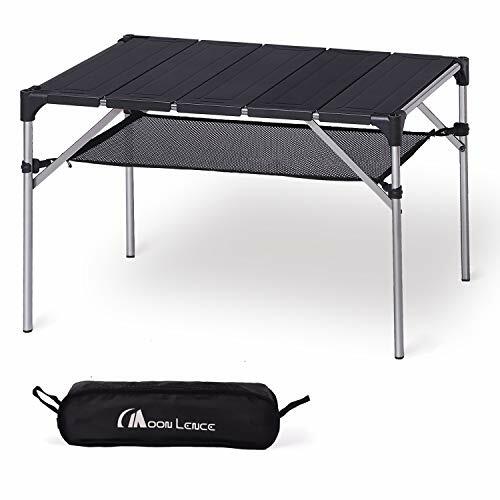 Including stools in a portable package, this is probably one of the best camping tables 2019 for the price. 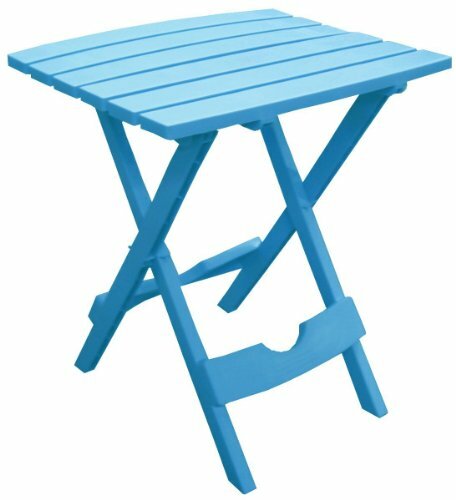 Review: There are a number of collapsible picnic tables on the market, all with varying degrees of quality. Both table and four seats are connected in one unit and fold down into a suitcase. This one seems to be pretty decent and it does come with the parasol. They claim it can sit four adults up to 200 lbs each, but I think these benches are generally best for the kids. Won’t suit medium to larger adults. 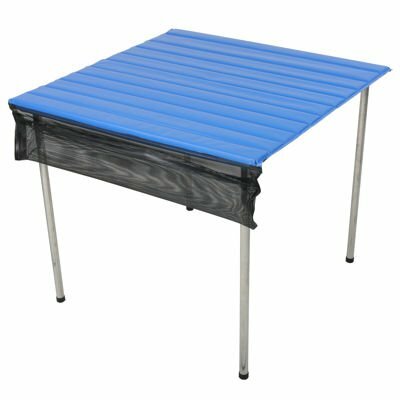 One of the best family camping tables if you’ve got loads of little ones running around. They’ll love it, too. Review: This is a really clever design, with strong wooden slats contained inside waterproof material. The aluminum legs are tough, and I especially like the way the top concertinas down for storage. It’s well built, easy to clean and will fit four around it easily – despite being relatively compact. Takes a little longer to set up. 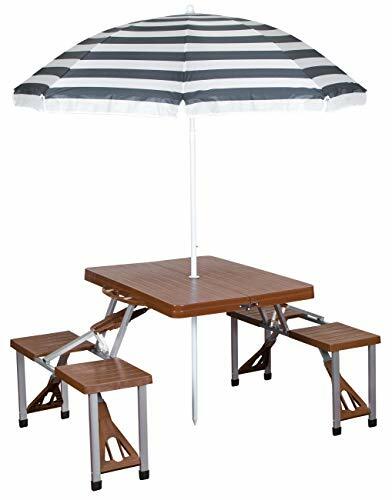 Considering you can fit four around this with legs under the table – it’s a really good option for portable dining. Review: Similar in design to the previous entry, this stylish table is made with bamboo and it smacks of quality. It’s one, the complete unit which sets up and can be taken down in seconds. The aluminum legs are easy to adjust and it packs up really small considering how much space you can have around it. It’s one of the more attractive portable tables available. Might not be as easy to clean spills as a plastic table. An eye-pleasing design, coupled with super easy assembly and a quality build, makes this camping table a real winner. I think I want one. Review: Coming into the more expensive end of the camping table world and we’ve got this stylish and sturdy design by Helinox. 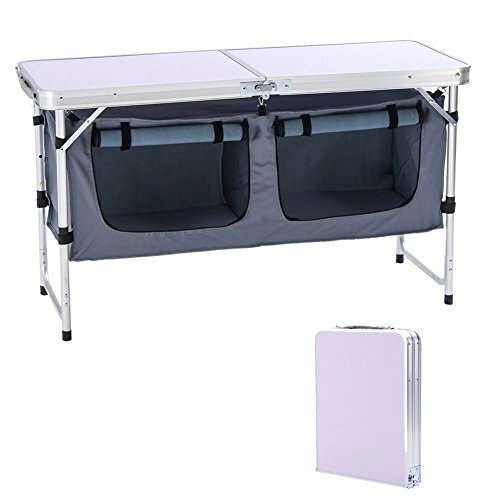 It’s a nylon fabric table-top with mesh cup holders, but it is the aluminum and bungee-cord connected frame that really catches the eye. Easy to set up and dismantle, the real kicker is that it only weighs 1.5 lbs. 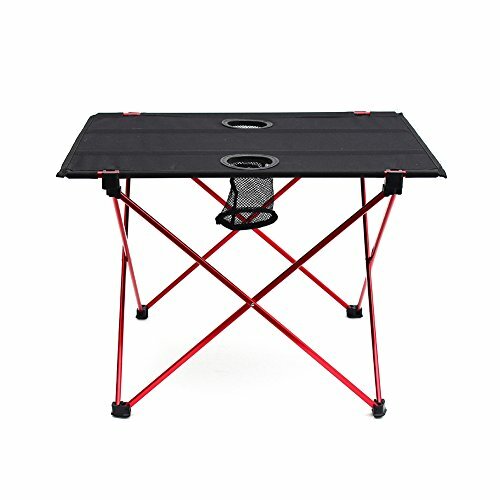 An ultralight camping table that is easy to transport. If you hikers really want to pack a table for your next adventure, this is the one you need. 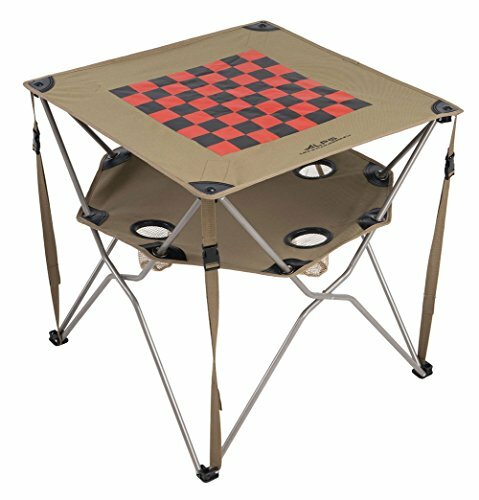 Review: Quite simply this is the best camping table and chairs I’ve seen. It certainly isn’t the lightest, but with car camping or if you’re not moving around too much then you can’t go wrong. It’s built to last a lifetime, with aluminum frame construction and 630D padded polyester bench covers that will take 240 lbs each. And it all folds down into one portable unit. This is a camping table for grown-ups. 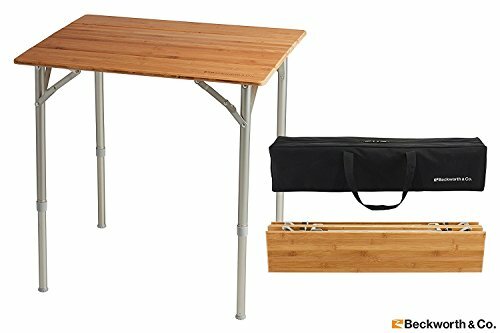 An outstanding portable table with benches that is well worth the money. Regular vehicle campers aren’t going to want to miss this. A must if you like your creature comforts. Feel free to peruse the information below on what to look out for in the camping table market, in an effort to assist you in your decision-making process. As you can probably tell, camping tables are available in a variety of designs, all with their advantages and disadvantages. Making the right choice depends on what you’re going to use it for. If it’s puzzles, board or card games you’re after, a table with slats isn’t going to be very practical. A group of four adults won’t be able to dine well around a table for two. 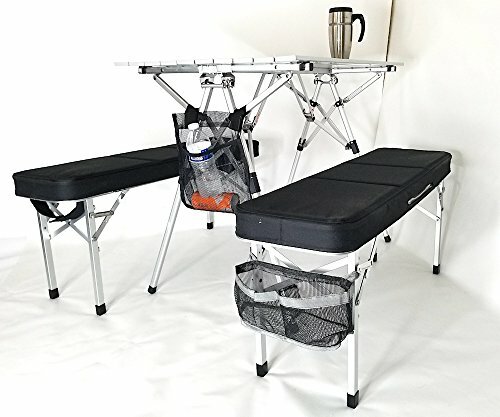 Hikers or climbers will find the foldable suitcase style tables utterly useless. Choose a table that is best going to suit your needs. From tiny, compact designs to larger models that come with their own benches, you’ll find products offering a lot of choices when it comes to their size and weight. Again, it depends on what you’re target use is. If you’re not staying in close proximity to your vehicle, you’ll want to choose one of the lighter, more portable tables. But if that’s not an issue and you’re simply unloading close to your trunk, larger, heavier tables might be the way to go. Generally speaking, they tend to last longer too. Hot on the heels of size and weight, is how portable a product is going to be. The basic dimensions of a table should be taken into consideration – particularly when it is packed down. Does it come with its own carry-bag? Does it have a shoulder strap or handle for easy transport? Is it cumbersome or bulky? Could an 8-year-old lift it because you’re going to make them do all the hard work? Finding a nice balance between quality, size, weight and portability will be one of your biggest challenges when selecting a new camping table. In general, you’ll find that camping tables are constructed using the following materials. Steel or aluminum – usually for the frame and legs. Canvas/Oxford cloth/nylon/polyester – if it’s a fabric table top. Plastic or some form of tough resin. With some exceptions, you’ll find it’s nearly always a combination metal and one other material. A table that is going to be regularly used outdoors needs to be able to stand up to the elements. And some of the materials mentioned above do it better than others. Steel is stronger than aluminum, but the trade-off is that it’s much heavier and nowhere near as portable. Fabric table tops are lighter, but they’re also prone to tearing with regular use and are much more difficult to clean. Wood and MDF can be solid options but will be heavier and susceptible to their own problems with wear. And of course, you should ensure that the design is water resistant at the very least – because we’ve all left stuff out in the rain. 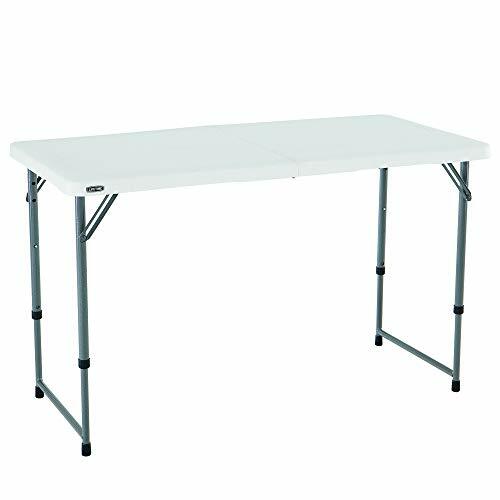 When it comes to camping tables, there aren’t that many extras that a manufacturer is going to be able to tempt you with. You want something that will hold stuff – nothing more. Mesh cup holders or zipper pockets on the fabric models are a nice touch – and there’s even the gaming table that has a chess board printed on the top. Other than that, so long as it does the job it was bought for you shouldn’t need anything else. You can buy a serviceable camping table for a song these days – but that doesn’t mean it’s going to stand the test of time or actually be any good. You pays your money and takes your choice. As with everything – prepare to part with more of your hard-earned if you want the very best quality. To each their own. Check with the manufacturer’s specifications before you make your choice, as each table will have different limits. As a rule of thumb, wooden or MDF tables with steel legs will be able to take more than fabric or aluminum versions. But also as a rule of thumb, I wouldn’t risk overloading any of these products anyway – and certainly, don’t sit on them – even if they claim you can. In all honesty, I wouldn’t risk it. Obviously not the canvas models anyway. The aluminum table tops could probably handle it, but you never know what the heat might do to the coated MDF or wooden products. If you’re looking for somewhere to stand your camping stove, I’d suggest looking at dedicated camping kitchen tables – the kind of which I haven’t covered in this particular review – but are specially built to take your culinary skills outside. Again, this depends on the design – but some of them are quite ingenious. Some models you have to remove the legs first, others they’ll just all fold up altogether. For some, the table top will collapse and then you store the legs with the rolled up top in a carry bag. Some units are one, contained unit and will fold down into a handy, portable case. Make sure you’re comfortable with how your chosen table assembles and disassembles. It can genuinely be the difference between a happy customer and someone going postal. All that remains is for you to decide which portable picnic product is perfect. Do let me know in the comments which design you’re contemplating and why, and watch this space for more travel-orientated reviews coming soon.